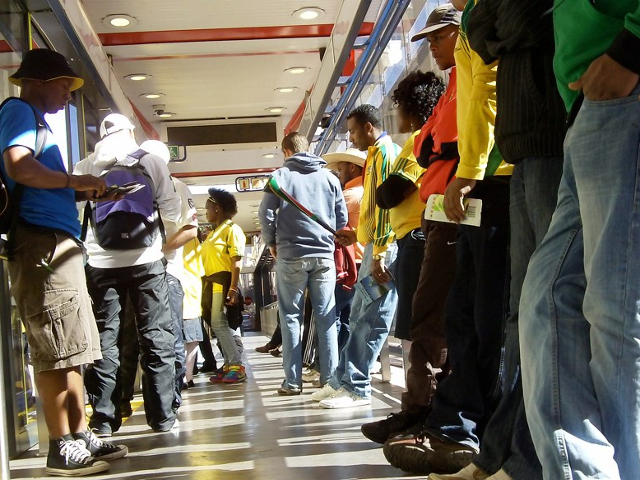 Passengers wait to board Rea Vaya, Johannesburg’s advanced bus system. Photo by African Goals. Last year, I spoke at the 2nd Congress and Exhibition of African Public Transport in Johannesburg. For me, this was a perfect, much-awaited opportunity to experience Rea Vaya. Rea Vaya (which means We are Going) is Johannesburg’s advanced bus system launched in 2009. It holds the distinction of being the first example of an integrated transport system in Africa. Rea Vaya’s network extends far beyond main trunk routes. Feeder buses operate in outer areas, transporting many residents into the city. Complementary buses ferry people between corridors. With Rea Vaya’s hi-tech Intelligent Transportation System (ITS), the service attracts several thousands of passengers on a daily basis. On one of the many days I rode Rea Vaya, my bus was in an accident. Heavy rain, high speeds, and a long road with a sharp, blind turn almost led to a head-on collision with an approaching bus. Our bus driver, with great presence of mind, took a sharp left turn, converting a potentially fatal accident into a minor one. No one was hurt, although passengers were shaken. Within 10 minutes, an ambulance and emergency response team arrived on the scene. What’s more, another bus arrived within 15 minutes to transport conference delegates and other passengers onward in their journeys. The Rea Vaya operating authority deserves a mention for its quick and efficient emergency handling. Incidents like these highlight the importance of road safety in public transport projects. In urban areas, roads are often designed for motorized vehicles, ignoring the needs of pedestrians and cyclists. Footpaths, crossings, and bicycle lanes are not given priority. People are forced to cross roads haphazardly – bicyclists have no option but to use the edge of the road, which is also a space used by heavy trucks and buses. The inherently risky behaviors of pedestrians and cyclists – born out of necessity and lack of choice – often lead to major and fatal accidents. Statistics indicate that globally 1.3 million people die in road accidents every year. The problem is only going to increase unless we address this urgent issue. Rea Vaya’s example shows some of the measures that can prevent such accidents. Curved lanes in a BRT road can be widened – advance warning and dividers between curved sections help drivers to make safe decisions. Other safety tools, like rumble strips, crash barriers, better lighting and driver training can only be developed and contextualized after a detailed road safety audit of the BRT corridor. EMBARQ has gained significant expertise in conducting road safety audits on a number of BRT systems in India and across the world. Through close collaboration with governments and administrative bodies, EMBARQ has developed road safety design guidelines for the bus system, which address mobility and accessibility on bus corridors through the primary viewpoint of safety. It is universally accepted that BRTs are a safe, cost-effective and environmentally sustainable form of public transport, primarily because a central BRT lane places buses away from the paths of other vehicles, pedestrians and bicyclists. BRT systems also necessitate changes in road infrastructure with an emphasis on passenger safety – such as refuge islands and shorter pedestrian crossings. A BRT project, if done right, can significantly reduce road accidents. Rea Vaya is not only a standout as the first BRT system in Africa. It is a stellar example of continued efforts to improve road safety for all road users. 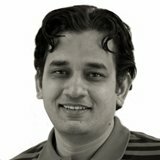 Amit is the Strategy Head – Integrated Urban Transport at EMBARQ India. Based in Delhi, he provides vision and leadership to all transport initiatives across EMBARQ India. Amit leads the work around BRT projects and city bus services in Surat, Indore, Jaipur and Bangalore; urban transport projects in Naya Raipur; restructuring the auto-rickshaw sector in Rajkot; and developing a public bicycling scheme in Jaipur. Amit has over 12 years experience in the field of transport and urban development.